I was able to upgrade to Windows 10 on my Dell XPs 13, Microsoft Surface Pro 3, and new Dell 8700 desktop with no problems. When I attempted to upgrade my HP to Windows 10 with a Sapphire Technology Radeon R7 250X video card installed, I got the Windows 10 Black Screen of Death (BSOD). After the upgrade completed, I logged in for the first time. Windows initiated its normal Windows 8-like “Getting Ready” procedure. When I returned to my computer, I saw an empty, black screen with only the cursor visible. I tried a couple of solutions I found on the web including hitting the Ctrl key once and blindly typing in my Windows password. None of the things I tried worked. I pressed and released (I didn’t hold it down) the power button on my computer. My computer then shut down or went to sleep. Based on this action, I theorized that the computer was “working” and that my black screen of death was potentially a video issue. This theory led me to the very easy fix (see below). As I mentioned, I have a Sapphire Technology Radeon R7 250X video card installed. I also have a motherboard that has its own pair of DVI ports. 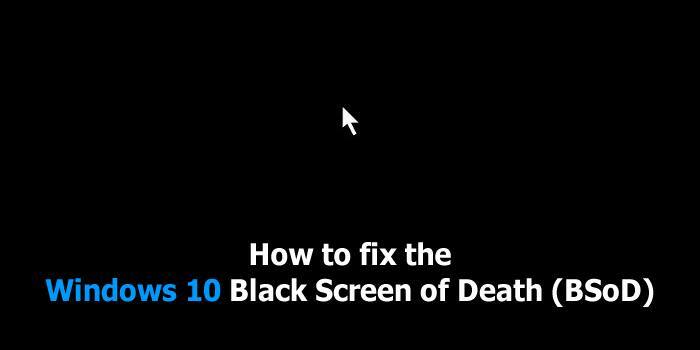 If your set up is similar to mine, the fix below may help you to resolve the Windows Black Screen of Death. Performing these steps may lead you to losing data or damaging your computer. Perform these steps at your own risk! Try pressing the power button once and seeing if the computer will shut down (mine did). At your own risk, hold the power button down until the computer shuts down. 2. Disconnect your video card from the motherboard. In my case, I just unplugged the video card power cable and that was good enough. You may have to completely remove your video card. 3. Plug your monitor into the motherboard video port. If your mobo (motherboard) has multiple ports, you may have to try both of them before these steps work for you. My mobo has two ports and I have three monitors so I plugged two of my monitors into both mobo video ports. I was then able to boot to Windows 10 normally! Yeah baby!!! 5. Download and install the latest drivers for your video card. Visit the web site of your video card’s manufacturer and locate either the “drivers”, “downloads”, or “support” section. Hopefully you can track down the correct driver for your card with no problem. 6. Shutdown your computer, re-install your video card, re-attach your monitor(s) to it, and restart your computer. Hopefully these steps will get you working again. If you are still getting the Windows 10 black screen of death, share your experience in the comments section below.